The cusp of a new year and the winter solstice have arrived and it is again that time when, Noticing New York returns to its now annual tradition. Since 2009, Noticing New York has annually offered a stocktaking of the decisions we are making in the public sphere that make it appear that we are veering off to a reality where a select few of our population revering money and accumulating “wealth” count for almost everything while the rest of us are treated with increasingly less regard. I’ve done this in the context of two traditional Yuletide tales, both taking place in critical part on Christmas Eve, and both essentially the same story in many respects: Dickens’ “A Christmas Carol” about the reformation of the miser Scrooge and Frank Capra’s “It’s a Wonderful Life.” Both these stories frame the importance of free will and choice in terms of alternative possible realities, in order to contrast decisions about the bunching up of wealth and treasure with the benefit and spirit of shared community and giving. With the arrival of the solstice hope is kindled during these longest nights of the year by noting that we have reached a turning point with light beginning to return. In the darkest of days it is always important to give thanks for all that’s good and all that we have been able to achieve. This 2014 there has been some good news to lift our spirits . . . .
. . . .Governor Cuomo just recently announced that hydro-fracking is being banned in New York State. That is a big win bringing what may be the end to a long fight and it prevents the ravaging of the environment belonging commonly to all of us for the financial benefit of only a few.
. . . There were victories also in the fight to save our public libraries from sale and shrinkage for the sake of creating real estate deals, another struggles where the public commons has been in jeopardy, again for just a few benefit at the expense of the many. The biggest of these successes this year was the defeat this spring of NYPL’s Central Library Plan that would have squandered more than $500 million of the public’s money and resources, the full extent of that loss being announced only belatedly after the plan was officially derailed. . . . . 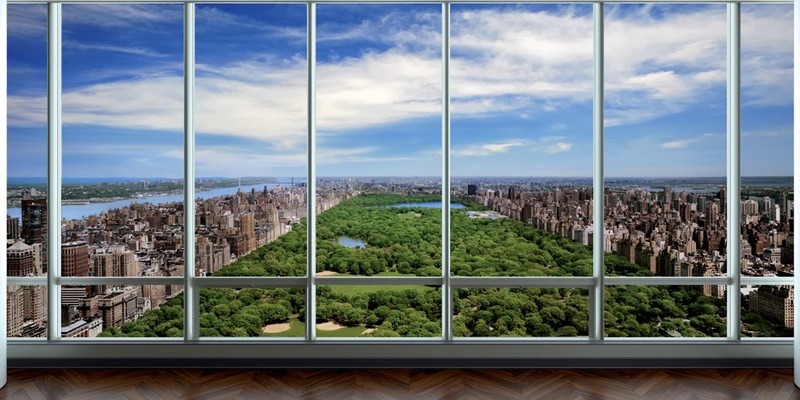 The New York City real estate industry is increasingly recognized as increasing the city’s wealth and power inequalities and destructive of the public’s interests. Just around Thanksgiving a Bill Moyers & Company report devoted to this theme made such points clear sounding very much like Noticing New York and a number of its articles. 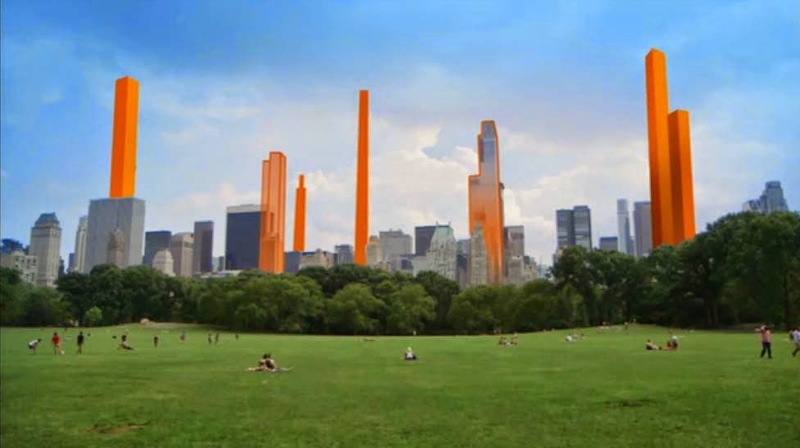 In fact, that report started with and was keyed off a reflection of the damage to the city, Central Park another critical public commons being done by the series of super-tall towers at the park’s south end casting shadows across it. That is exactly what Noticing New York’s annual seasonal reflection focused on this time last year. But, not all is improving and there is much that remains to be done as some things get even worse. One matter these annual reflections have always tuned to is the way that Forest City Ratner’s takeover of a swath of Brooklyn constitutes a concentration of wealth and control that’s analogous to the way that in “It’s a Wonderful Life” the communally shared town of Bedford Falls became Pottersville in the alternate reality where unchallenged power was allowed to accumulate in the hands of Henry F. Potter, the bad town banker. The unfortunate news to report this year with respect to Forest City Ratner is that its spreading power and influence in New York is continuing to grow like Potter’s did in that alternate reality. . .
George Bailey, the good banker of the "Wonderful Life" story, gets to see what the world would be like had he never been born, counterbalancing to make it better: everywhere he turns Potter's negative the influence of doing things only to dominate and make money pervades. Just months ago the head and Chief Executive Officer of Forest City Ratner, MayAnne Gilmartin, was appointed to the board of WNYC, the city’s highly influential public radio station. See: Sunday, November 16, 2014, Is Forest City Ratner, As Victor, Writing Our History?- WNYC's Press Release on Appointing Forest City Ratner's MaryAnne Gilmartin to Its Board of Trustees, and Monday, December 8, 2014, With Big Bucks Out To Hijack Truth and Broadcasting Integrity- The Daily Show and Bill Moyers Set Models for WNYC Radio. Oddly, WNYC has its own annual yuletide tradition that ought to teach it better. Every year the station broadcasts a radio play version of “A Christmas Carol” in which the familiar radio personalities of WNYC appear performing roles. This year, as I listened, I heard the principle declared that, however fortunate or relatively unfortunate any of us are, we are all equals, “one in the same.” I believe that, but is that the message we would glean from the Ms. Gilmartin’s appointment to the WNYC board? Would those who would and could truly represent the interests of the general public in fashioinging the public radio station's mission have as equal a chance of being appointed to its board has as equal a chance of being appointed to the board? Scrooge (To his nephew Fred): You keep Christmas in your own way let me keep it in mine. Nephew: But you don't keep it! Scrooge: Let me leave it alone then: Much good it has ever done you! Nephew: And I've always thought of Christmas time is a good time, a kind, forgiving and charitable time when men and women seem to open their shut-up hearts freely, and think of people not as fortunate in life as their equals, for they very well are equals. We're all one in the same. And therefore uncle, although it has never put a scrap of gold or silver in my pocket I believe Christmas has done me good, and will do me good but I say God bless it. Cratchit (Scrooge’s cleark): Well put Fred! "Keep it!" repeated Scrooge's nephew. "But you don't keep it,"
"There are many things from which I might have derived good, by which I have not profited, I dare say," returned the nephew. "Christmas among the rest. But I am sure I have always thought of Christmas time, when it has come round-apart from the veneration due to its sacred name and origin, if anything belonging to it can be apart from that-as a good time; a kind, forgiving, charitable, pleasant time; the only time I know of, in the long calendar of the year, when men and women seem by one consent to open their shut-up hearts freely, and to think of people below them as if they really were fellow-passengers to the grave, and not another race of creatures bound on other journeys. And therefore, uncle, though it has never put a scrap of gold or silver in my pocket, I believe that it has done me good, and will do me good; and I say, God bless it!" The message, of course, is also that much of the good in the world simply can’t be measured in dollars. That’s bad news for those who relentlessly look to “monetize” all and sundry and consider subjecting everything to the constricted and constricting measures of the Wall Street mentality. Alistair Sim, perhaps the very best ever to play Scrooge. On left, Scrooge the epitome of a miser at the outset of the film. On right, the reformed Scrooge now a model of kindness and generosity. 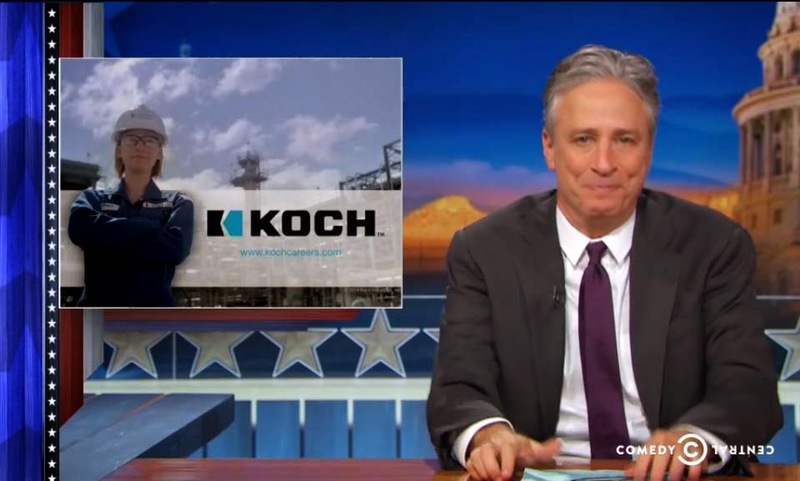 October 29, 2014, Jon Stewart takes on the Koch's when they advertise on his show. A Model for Public Broadcasters, Maybe WNYC Public Radio? That raises the question of what happens when similarly objectionable sponsors hope their money plus messages will hijack the public’s reliance on the integrity that people expect from public broadcasting, integrity we expect partly because so many of us ante up our own contributions so that such broadcasting will be paid for largely by our own listener dollars.. . . The fracking industry has been paying public radio to run its pro-fracking “think about it”campaign. David H. Koch, a heavy funder of climate science denial, sponsors, with mysterious intention ,“Nova,” a premier PBS science program. And David Koch has been put on public broadcasting boards! Where is Stewart’s spirited, contextual, integrity-regaining push-back against such sponsorships on these non-commercial public networks? Similarly, what does public radio station WNYC do when $$$$$ is flashed by an objectionable and powerful entity intent on selling fictions about itself? Do they perhaps put that entity’s Chief Operating Officer on its policy-setting board and send out a press release that spiffs up that CEO’s reputation, if that, in fact, is the very least they do? (Would that be a poor attempt to follow in the steps of the Daily Show to evoke laughter?). . .
. . . At least $$$$$$ is the presumed reason that people believe that MaryAnne Gillmartin, the CEO of our local real-estate-subsidy-pursuer Forest City Ratner, was recently appointed as a WNYC trustee, because people can see no other explicable reason for her appointment other than $$$$$ and see lots a reasons why she should definitely not have been appointed to such a position. 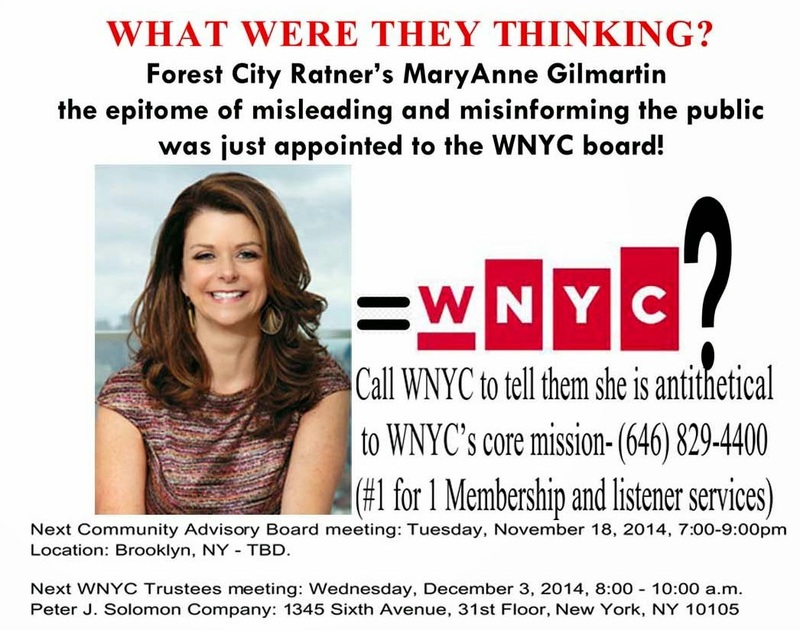 See: Sunday, November 16, 2014, Is Forest City Ratner, As Victor, Writing Our History?- WNYC's Press Release on Appointing Forest City Ratner's MaryAnne Gilmartin to Its Board of Trustees and Tuesday, November 18, 2014, Was Forest City's Gilmartin appointed to WNYC board because of "passion for public radio" or fundraising help? How does one push back effectively? 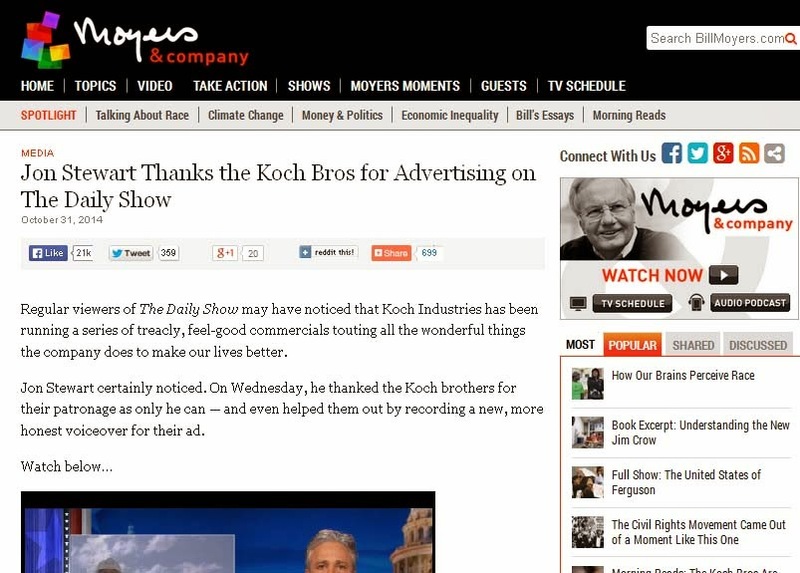 For the Daily Show the vehicle was humorous satire, but the “adjusted” Koch brothers commercial the Daily Show crew created provides a model for what to do when someone comes knocking at your door seeking to buy what will be perceived as true. Such a response doesn’t necessarily have to be couched in satire. . . . And the essence of the Daily Show’s tactical response applies quite well to the ways that Forest City Ratner can be outed when it lies about itself. 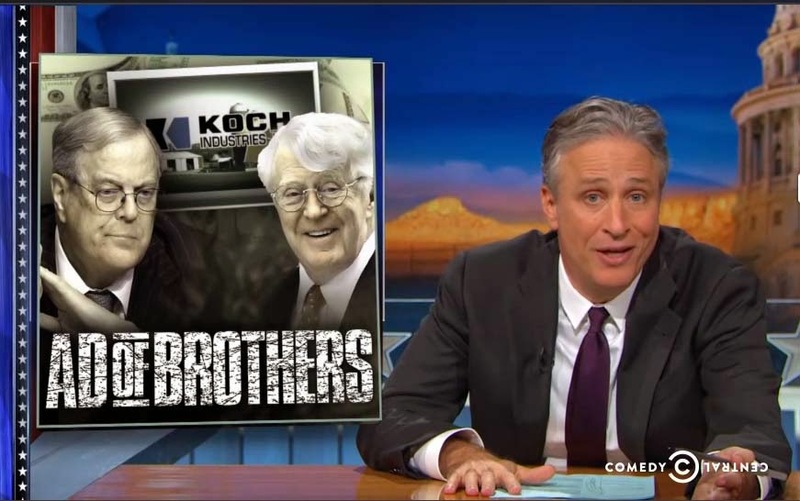 • Who the Kochs are really are behind this offered veil, a not so friendly giant that’s far too eagerly controlling far too many aspects of our environment. • That their commercial is the facile purchase of a cheerily false veneer of happiness, a virtual “smile factory” to generate a “how bad could they be” message. • That, in a shadowy way, they deploy a spider web of dark money that buys our elections and politicians. • That the ad is far more important for what it leaves out than for what it includes. • The ad has a 180 degree from the truth message: We are making your (the listeners’) lives better, instead of, in actuality, destroying much of the essential environment and natural ecosystem around you. • There is a scary ubiquity, omnipresence, inescapable dominance on the part of the sponsor, relegating or exiling the rest of us to potential non-entity status. • That even our thoughts and basic understanding of the truth is at risk as these entities work to indoctrinate all, even our innocent children, to believe their manufactured falsehoods and seek to commandeer and rewrite our sources of knowledge. • That, in their view, everything, every aspect of us, is up for their monetizing grabs. • That they are unfair to the average worker they employ, offering low wage jobs. (Above: Democalypse 2014 - South by South Mess: Ad of Brothers, October 29, 2014, click through to Daily Show for best viewing). If you haven't already watched this four-minute Daily Show segment I highly recommend that you do and I don't think that my analytic summary above will subtract from your chortles or appreciation of what an exquisitely structured piece it is. . . . I have another choice segment of exquisitely constructed video, 22 minutes, that I am going to urge you to watch that I will discuss here as a second model for where WNYC should want to head in dealing with Forest City Ratner and the New York City real estate industry in general. This one is from another broadcaster, Bill Moyers. I specifically cited it as such an example in an email I sent to WNYC president Laura Walker in follow-up to talking with her after the last WNYC trustees meeting. First let me set the scene a bit. 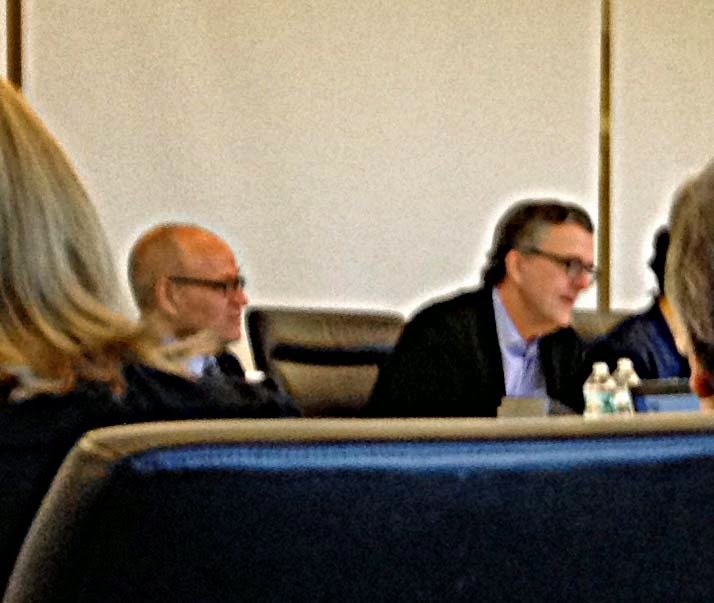 November 18, 2014 WNYC Community Advisory Board meeting. Attendance of New Tech City's Manoush Zomorodi (facing, far right) was featured. Some of us who considered absurdity together with danger to be inherent in Ms. Gilmartin’s appointment to WNYC’s policy-setting board went to the last two WNYC Community Advisory Board meetings (October 20, 2014 and November 18, 2014) to comment and object. By the second of these two meetings the advisory board was beginning to weigh and think about our objections. Unfortunately, the advisory board is no more than advisory; it doesn’t run things and can only relay to the board of trustees that does run things the feedback gotten from the public. Unfortunately, the Community Advisory Board’s reports to the WNYC trustees board are only annual. The next report including these objections won't go to the trustees until October of 2015! No matter, some of us then went to the December 3, 2014 WNYC trustees meeting, the first trustees meeting held since Ms. Gilmartin was placed on the board. 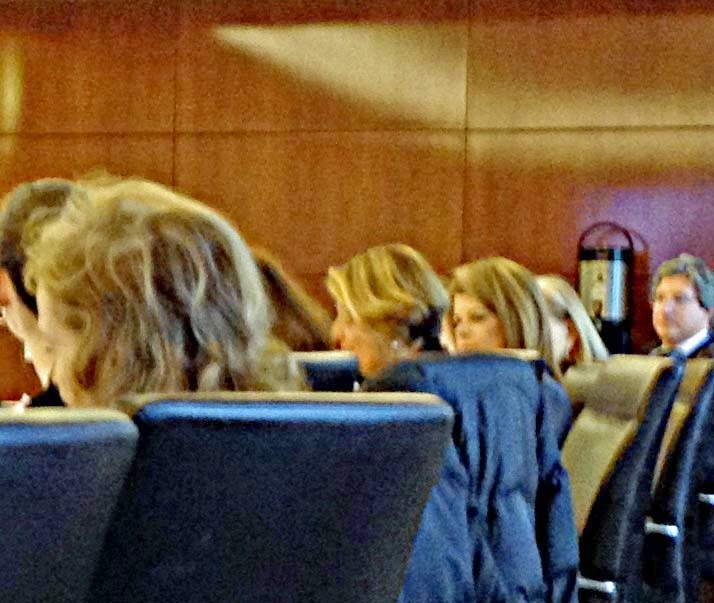 Ms. Gilmartin sat in a seeming position of honor right next to Laura R. Walker, board member, President & CEO of WNYC who conducted most of the meeting. Ms. Gilmartin sat somewhat sullenly without speaking, probably aware that objections had been raised about her appointment. When I spoke with President Walker afterwards she said that, because seating at the meeting was not assigned, nothing should be inferred from who was sitting where, but she refused to say who sat next to whom first respecting Ms. Gilmartin and herself. While the WNYC board apparently hadn’t heard from the Community Advisory Board, a number of the members, Ms. Walker included, were expecting us and knew why we were there. Even so, apparently not all the members were similarly aware and the Noticing New York’s article about Ms. Walker’s appointment had not been distributed to all the trustees. An opportunity for public comment was not part of the meeting, but Ms. Walker noted that the public could approach and speak with the trustees who lingered after the meeting's executive session (during which the public had to exit the room). Returning afterwards is when I spoke with Ms. Walker and an assisting staff member. I was told that Ms. Gilmartin’s appointment had been in the works for more than a year. Although I pressed for an answer, Ms. Walker would not say whether anyone had raised the obvious likely objections to Ms. Gilmartin’s appointment other than to let me understand that there had been discussions about Ms. Gilmartin's qualifications. I asked, and Ms. Walker said that she had known Ms. Gilmartin for a number of years. At the meeting, and outside of it afterwards, there was discussion about a gala (including what to wear) and, outside the board meeting room, there was also some discussion about how there was a lot of money in the borough of Queens, as in Flushing, that was not and ought to be represented on the NYC board. As we were there to say that representation of actual people and listeners ought to be represented in the composition of WNYC’s board, not Forest City Ratner’s money, I was sensitive to the phraseology that there was “money” in New York City that needed to be represented on the board. My Noticing New York point of view is that WNYC and public broadcasting is intended to be an alternative to the relentless expression of commercial speech and is not supposed to be setting up a he-said/she-said balance on its board between all of the city’s commercial interests and those of the public. There is also concern that with any such `balance' it will shift inexorably in the direction of the commercial interests represented. 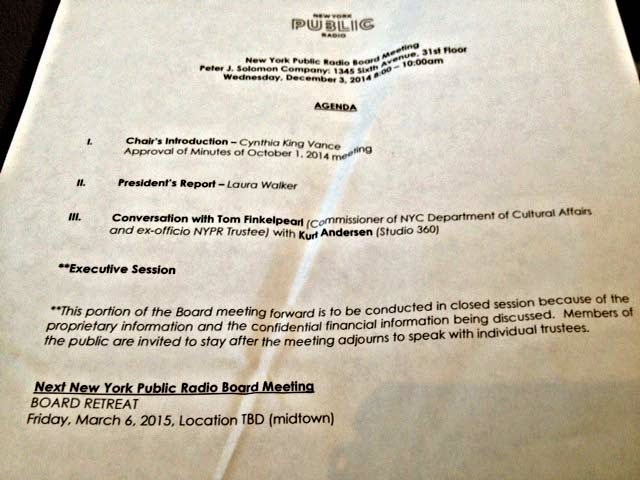 As if to emphasize the intersection of NYC's coverage of news and culture in New York with governance and politics, a centerpiece of the publicly held portion of the trustees meeting was a half hour interview of NYC Cultural Affairs Commissioner Tom Finkelpearl. He was interviewed by Kurt Andersen, known for his "Studio 360" program broadcast in prime slots in the station's line up. Andersen quipped that without the editing and typical winnowing of a typical "Studio 360" interview (talking for an hour but getting the best ten minutes) he and Mr. Finkelpearl were not going to sound nearly as good as what usually goes out on the air. It was, indeed, odd to hear Mr. Andersen's familiar voice associated with a face I might not have guessed went with it. Present in the room with him, he didn't sound quite so perky. If you'd like to listen to Mr. Andersen, "Studio 360" did an absolutely brilliant, recently rebroadcast, 2013 hour about the Disney Company parks that included discussion of urban planning issues, but not in ways that would relate those issues obviously to NYC. Commissioner Finkelpearl, a pleasant, erudite fellow may be familiar to our readers as he has gone to bat several times to speak on behalf of "Spaceworks." Noticing New York views the Spaceworks very differently since the private Spaceworks firm, formed at the end of the Bloomberg administration (and not covered by WNYC yet) albeit "nonprofit," seems to have a decided real estate bent and has declared as one of its primary missions the acquisition and shrinkage of New York City Library space as "underutilized." The Finkelpearl/Andersen interview discussing how culture and economics interrelate generally got around to discussing real estate, specifically Hudson Yards, which, as it is a thematic sister to Forest City Ratner's Atlantic Yards, should have been reason for Ms. Gilmartin's ears to perk up. Conversely, might Mr. Finkelpearl's perception of Ms. Gilmartin have gotten an adjustment from sitting across from her that morning? Hudson Yards is fewer acres and in many ways not as bad as Atlantic Yards, but similar vintage, both being mega, single developer projects sired under Bloomberg. The discussion of Hudson Yards came up in the context of the millions of dollars the city is spending in terms of "partnerships" with cultural institutions and how culture, in the likely form of a governmentally assisted institution ($75 million), could be integral to moving the huge, single-developer Hudson Yards project along. Concluding the Finkelpearl session, trustees were able to put their own questions to the Commissioner and the first as about whether Mayor de Blasio cares sufficiently about the Metropolitan Museum of Art. Mr. Finkelpearl said this was not true, recounting that the department was actively involved with the Met and that he police commissioner had gotten involved with the issue of food cart vendors outside of the Met. The issue has been exacerbated by the opening of the new (publicly protested) David H. Koch plaza outside the Met and is one that David Koch, living nearby, is speculated to be one he takes a personal interest in. Koch thought the old fountains outside the Met were "crummy" and says of the replacement scheme "I suggested the whole project," reportedly getting into the "micro-details" of it. We heard Mr. Finkelpearl explain that the Met gets $24 million a year from Cultural Affairs plus often getting "large capital investments." City schools get $22 million yearly from the department. Mention here of David Koch provides an opportune segue to discuss the Bill Moyers segment I recommend and the email I sent about it to Ms. Walker. The Koch brothers represent the essential epitome of the fossil fuel industry and its outsized power. In my email communication to Laura Walker about omissions that weaken WNYC’s coverage I cited, by example (you see how I detailed this in the actual email I sent below), the new episode of Moyers & Company that addressed itself to the outsized power of the real estate industry in New York City. One point made during the Moyers show was the equivalency of the real estate industry vis-à-vis New York City to the overbearing influence of the oil and fossil fuel industry nationally. 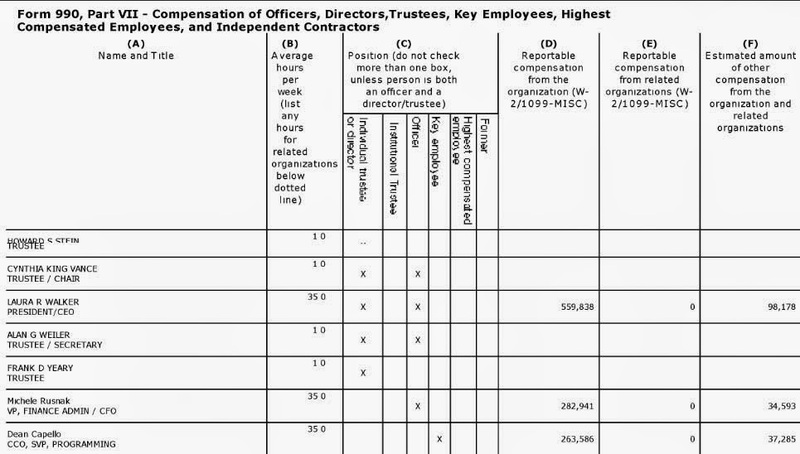 In point of reference, talk show host mainstays Leonard Lopate and Brian Lehrer were paid for that reported year, $236,211 and $287,084, respectively (plus, respectively, $25,219 and $31,900 in the category of deferred compensation and non-taxable benefits). From Noticing New York's December 24, 2013 coverage (like Moyers) of the plutocratic towers casting shadows on Central Park- Slide promoting Skyscraper Museum Show-"View of Central Park from One57"
When we talked after the WNYC board meeting yesterday you said that if there were ways I thought that WNYC could be doing a better job covering and addressing issues that I believe need to be addressed in this city I should let you know and that you would relay my thoughts to the WNYC editorial board assuring me that, notwithstanding the recent appointment of Forest City Ratner CEO MaryAnne Gilmartin as a trustee to WNYC's policy-setting board, that the listeners of WNYC will get the coverage of important issues that is deserved. In that regard, I call to your attention a new episode of Moyers & Company: The Long, Dark Shadows of Plutocracy, Aired: 11/28/2014. Although Moyers & Company is an independently produced nationally syndicated program that deals with issues of national importance I think you will observe that the entirety of this particular 22-minute program focuses on a series of connected concerns that are all local New York City issues, the kind that it would be the natural province of WNYC, our city public radio station, to cover. • The invasion of a significant public commons with its sacrifice to privileged private interests. 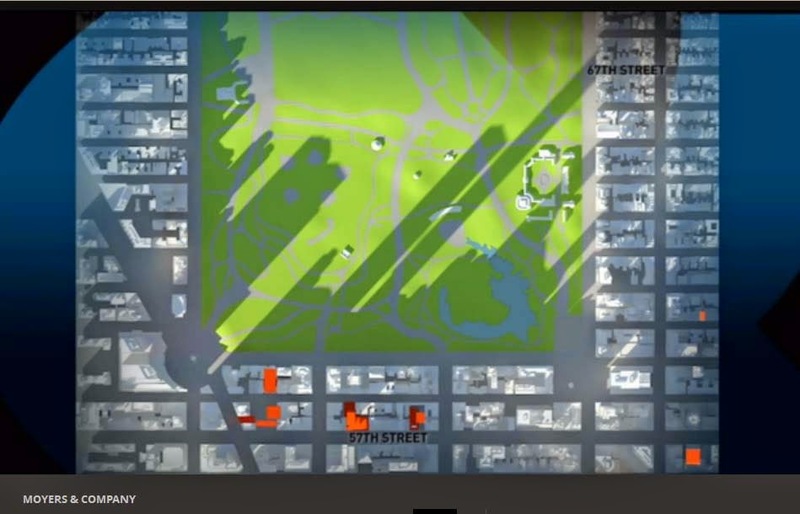 In this case that public commons is specifically, but also somewhat symbolically, the example of Central Park. It is important to remember that WNYC similarly represents a significant public commons. • Reminders of how our collectively shared commons represent the experience of democracy and its effective functioning. • An elucidating equation of the power of the real estate industry in NYC with the all too influential national oil industry centered in Texas. • How this disequilibrium translates into bad urban design and degraded living conditions for the average New Yorker with developer greed driving that detriment. • An analysis of how the "Swiss bank account money" fueling these subtractions from the public good (per New York Magazine's "Stash Pad" cover story) likely doesn't pull its weight in contributing to the local economy, notwithstanding former Mayor Michael Bloomberg's defense of the super-rich and his political urging that the NYC economy be channeled in this direction. • That, because of political machinations and dodgy deals in Albany linked to questionable campaign contributions, democracy and the public interest is being sold out in these regards, which means that these wealthy luxury apartment owners who very frequently don't pay local income taxes also very dramatically escape a proper shouldering of their fair share of real estate taxes. • How the Moreland Commission, set up to investigate abuse and corruption in Albany politics, was focusing on these exact city real estate industry issues when it was dismantled by Governor Andrew Cuomo as it got too close to his own conduct in regard to these particulars. • How the imbalances in the way we are managing our public resources is resulting in a less diverse, increasingly exclusive city with the needs of significant sectors of the population being insufficiently or completely unsupported. • Some thought about what makes for effective public protest and countering political actions in the face of these things. I doubt that you would disagree that all of these concerns plus the way that they are interconnected are of vital interest to New York City's populace and WNYC's listeners. I therefore invite you to submit this Moyers episode to your editorial board and ask them when WNYC has covered these issues and their interrelation with similar comprehension and vigor. I also ask you and the editorial board to identify when WNYC has subjected the Forest City Ratner organization and its activities that very much affect the city to the same kind of careful scrutiny. I recognize that pieces of much of the above have been covered in fits and starts from time to time by various WNYC programs. Brian Lehrer, for example, has (almost unavoidably) independently covered such topics as "stash pads" and the luxury towers casting shadows into Central Park, and has also had some excellent discussion about Governor Andrew Cuomo's dissolution of the Moreland Commission. Still, given that WNYC intends to be a station that prides itself on long-format, in-depth and analytical, in-context reporting, where is the kind of in depth reporting from WNYC that, like the Moyers story, pulls these things together, interrelating them for the kind of comprehensive overview that begs to be made? I've covered much of what the Moyers episode addresses in Noticing New York, routinely making most of the same connections, and I do so because it has been my priority to deal with what I believe is most critically in need of being addressed in terms of New York City development, governance and politics. That NNY coverage has been possible despite the fact that financially Noticing New York is essentially a shoestring, zero-budget operation. So it doesn't take money. Yesterday I repeated to you the suggestion made by one of the public attendees at the last WNYC Community Advisory Board meeting, that if comes to a question money (one of the CAB members suggested money was at the root of certain practices in question) that WNYC should simply consider "doing less with greater integrity." A side note before concluding: I realize that in holding out to you the Moyers work as an example, I may be undermining arguments I have recently been making because: 1.) It involves commendable actions recently taken by the Municipal Art Society although I have criticized MAS to the extent to which they, with board changes of their own, have abdicated- or reversed- much of the core mission MAS once pursued, and 2.) the broadcast came to New Yorkers via WNET Public television which I have criticized for not covering the the real estate industry issues that beset the city. Quite true, but: A.) MAS could hardly ignore the magnitude of the issue (even if it is interesting that after the 1980s TimeWarner building construction battle precursing this more recent tower shadows issue was not completely won, MAS appointed that questionable building's architect as its board chair), and B.) As a nationally syndicated program the Moyers show bypassed the local editorial board, and was not a product of it. I am thankful for WNYC's coverage of such local development issues and associated politics whenever it is clearly good, which it can be, but I am taking you up on your offer to communicate what needs and ought to be better, gaps that need to be filled. Please let me know and direct my attention accordingly, if I have overlooked WNYC coverage that would match up to the story that Moyers & Company just produced. Likewise, do let me know if you think that there has been rigorous coverage of Forest City Ratner that is comparable. If that's not the case, I'd be delighted to hear that you are communicating to the WNYC editorial board that there are standards toward which they yet need to strive with the expectation of beneficial results to follow. Years ago, I heard on public radio (I was traveling and I am not sure it was WNYC and cannot retrieve more facts) a fascinating speech by a prominent national female news anchor of the time. I am guessing that the speaker might have been Diane Sawyer and that this was in the 1990s. She spoke about what is perceived as “male” or “masculine” news, which was considered “hard” news and more important than what was considered “female” or “feminine” news. Political news was generally viewed as falling into the “masculine” news category that also frequently preoccupied itself with headlines about crises that might be covered with relatively short spans of attention from the media. Conversely, “female” or “soft” news, often dismissively viewed, tended to focus on the very intricate texture and meaning of our daily lives, often in ways that might help foreshadow or help us comprehend and prevent crises. I remember coming away from hearing the speech with a very deep respect for the importance of this deeper, more contextual, background kind of news often viewed as “feminine” and inferior. Fluffy News to Put You to Sleep? That being said, I am beginning to wonder whether there has been a programming shift at WNYC to the less substantial, less meaningful, the kind of stuff that life-style commercial networks already cover with more than sufficient adequacy. I asked Ms. Walker what she thought the purpose was of including Ms. Gilmartin in a July 15, 2014 Brian Lehrer segment about how to get a better night’s sleep. At the time that of that broadcast Ms. Walker and her board were obviously, based on what she said, considering honoring Ms. Gilmartin with an appointment to the WNYC board. Ms. Walker did not really have an adequate answer, except to say that Ms. Gilmartin was just there as another female executive although I pointed out that her appearance in that segment alongside Arianna Huffington, head of the Huffington Post and AOL was obviously burnishing for Gilmartin’s reputation. Indeed, done en masse under the vague “housekeeping” rubric, attested to an intention to hide exactly who was intended to be benefitted by whatever the juiciest handouts were in the group, but it was a safe bet that there were at least several really juicy ones, one of them perhaps the intention to build yet one more in the parade of supper tall towers south of the park at the site of the 57th and 5th Avenue’s Bergdorf Goodman!
. . . The Brian Lehrer show didn’t get around to covering the potential disaster but, thankfully, the plan was set aside after massive opposition anyway. The Leonard Lopate show got around to it after the fact, almost too late. 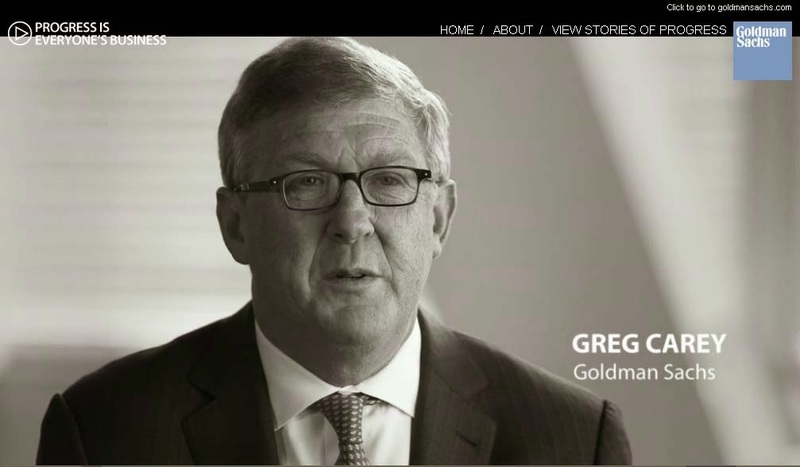 The Goldman Sachs commercial that pops up links to more video promotion for Goldman, including its involvement with huge real estate projects in New York City. There’s work for Moyers to do in this regard because the efforts of $$$$$ to encroach are everywhere. . . It’s ironic, but when I clicked to watch “The Long, Dark Shadows of Plutocracy” what I got first before it started to play was a “treacly, feel-good commercial” for Goldman Sachs and company “touting all the wonderful things the company does to make our lives better.” As written about previously here in Noticing New York, Goldman, including a subsidy-abusive real estate manipulation to build its own NYC office tower, was squarely targeted by Moyers in at least one previous Moyers broadcast. Does this go in the “you just can’t win” category? I’d like to think that Moyers has dished out far better than he has been subjected to, that his integrity is as mightily intact as it appears to be, and that at this point he is miles ahead of those who spend to piggy-back on his message, hoping to neuter the truth he offers. . . That he, like Jon Stewart, may still be thought of as setting a good example for WNYC. PS: Something for Noticing New York to do next? : Look more carefully at the composition of the rest of the WNYC board to consider whether we can expect there to be adequate checks and balances to the kind of influences that come with appointments like Ms. Gilmartin's.